From left to right, Capt. 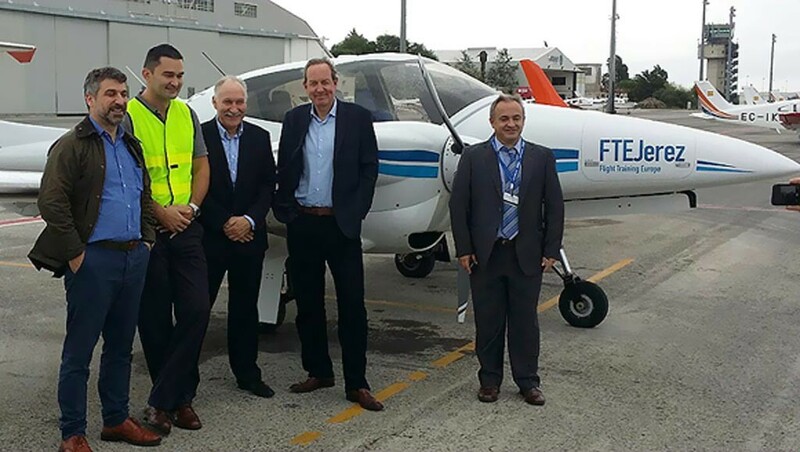 Filippos Siakas, 1st Officer Timur Masharev, Senior Vice President Operations Tony Regan, Mr. Peter Foster Air Astana President, and Oscar Sordo FTEJerez CEO. Mr. Peter Foster, President of the Kazakhstan national air carrier, Air Astana, accompanied by a senior delegation from the airline as well as a contingent of Kazakhstan media representatives, visited the FTEJerez campus last week. 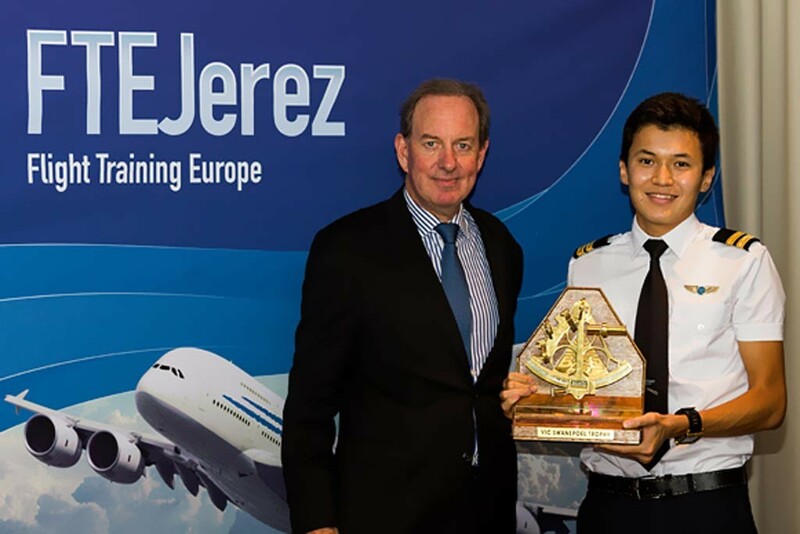 The visit coincided with the graduation of 13 cadets on courses 130 and 131, including the first 6 Air Astana cadets to graduate since the airline chose FTEJerez as their pilot training partner in late 2012. During his keynote address at the graduation ceremony at the Sherry Park Hotel in Jerez, Mr. Foster congratulated the graduates on having successfully completed the tough training course at what he described as “this fantastic facility”. He lauded the graduates on their choice of career and also made special mention of those of the graduates that self-funded their training at FTEJerez, mentioning that it was a brave step as they now have to start the task of landing that all important first flying job. He had some words of encouragement for them referring to the aviation industry that “has only one way to go, and that is up”! Altynbek Zeinelov, who won the Vic Swanepoel trophy for the overall best student in ground school on course 130 got a pleasant surprise when Air Astana Senior Vice President for Operations, Captain Tony Regan, announced that the airline had decided to recognise his achievement by giving him the option to chose which one of the Air Astana fleet he wanted to join. Altynbek Zeinelov receiving the Vic Swanepoel trophy from Mr. Peter Foster, President of Air Astana.